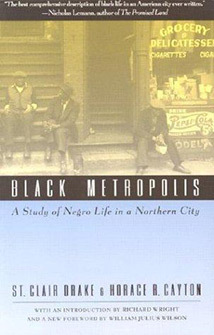 Groundbreaking when first published in 1945, Black Metropolis remains a landmark study of race and urban life. Based on a mass of research conducted by Works Progress Administration field workers in the late 1930s, it is a historical and sociological account of the people of Chicago’s South Side, the classic urban ghetto. Drake and Cayton’s findings not only offer a generalized analysis of black migration, settlement, community structure, and black-white race relations in the early part of the twentieth century, but also tell us what has changed in the last hundred years and what has not. St. Clair Drake was born in Suffolk, Virginia. Upon graduation from Hampton Institute (now Hampton University) in 1931, he became involved with The Society of Friends in the south. In 1946, Drake became an assistant professor of sociology at Roosevelt University. He was one of the first black faculty members at Roosevelt. While there, he created one of the first African American Studies programs in the United States. Roosevelt University dedicated The St. Clair Drake Center for African and African American Studies to his memory. Drake taught at Roosevelt for 23 years before leaving in 1969 to chair the Black Studies program at Stanford University. Horace R. Cayton, Jr. was a prominent American sociologist known for his studies of working class black Americans, particularly in mid-20th century Chicago, Illinois. Cayton was born in Seattle, Washington and moved to Chicago in 1929 to study sociology at the University of Chicago. Cayton is also the coauthor, with George S. Mitchell, of a work on the roles early 20th century unions played in the economic situation of blacks, Black Workers and the New Unions. Clayton wrote an autobiography titled Long Old Road - An Autobiography in 1963.